Our new online tool brings together disparate information to help government deliver support to drought-affected areas that need it most. The long stretch of dry weather is putting pressure on farmers and communities across the country. Plus climate and weather experts across the globe are predicting that droughts are going to become longer and more severe in some parts of the country. The severity of the current drought has certainly got everyone thinking about what we can do to help our farmers. And while there is certainly no easy fix, at least we know it’s top of mind for some of our best and brightest tech-sperts from Data61. Part of addressing this challenge involves gathering and interpreting disparate pieces of data to provide a comprehensive picture of conditions and drought response across Australia. We’ve worked with the Joint Agency Drought Taskforce to apply our Terria interface to create the National Drought Map. The National Drought Map is an online tool that brings together information on weather conditions, agricultural industries, state government drought declared areas and government drought support. Information includes rainfall patterns, soil moisture, government assistance available, town size by population, numbers of farm businesses, agricultural types and employment by industries. 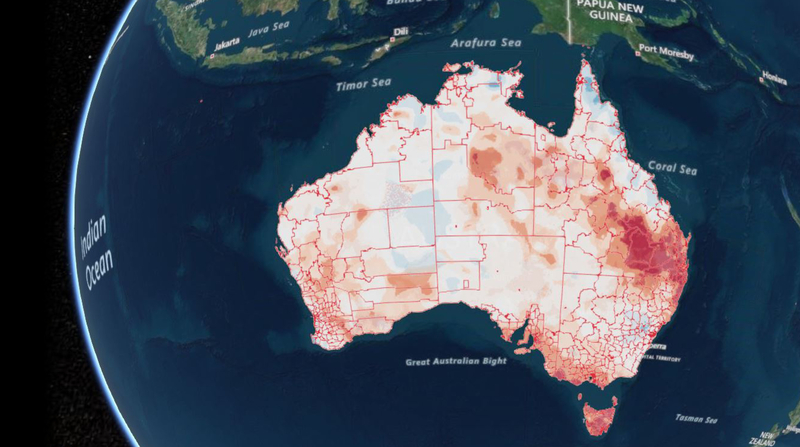 Launched today by Minister for Agriculture and Water Resources David Littleproud, the National Drought Map will allow governments and other stakeholders to gain deeper insights into current drought conditions to determine where more support is needed. It also facilities coordination of response and provides information on the spread of drought using the latest meteorological information. For example, understanding the climatic, economic and social conditions in a regional community and quickly identifying the services they can access. With this knowledge, governments can direct information sessions and services, such as the Department of Human Services’ Mobile Service Centres, where they are most needed.